Are you interested in scheduling a session of the programs listed below? Please call the trainers directly, or contact Coordinator Jess Hegstrom at 457-8970/ jhegstrom@lccountymt.gov to set one up. Intended for people from all walks of life, QPR (Question, Persuade, and Refer) is a one- to two-hour course designed to teach “gatekeepers” warning signs of a suicidal crisis and how to help. Gatekeepers can include friends, co-workers, supervisors, neighbors, parents, siblings, teachers, coaches, caseworkers, police officers, and firefighters, among many others. The process follows three steps: (1) Question if a person is considering suicide, (2) Persuade them to seek and accept help, and (3) Refer the person to appropriate resources. Information provided by the QPR Institute and the Suicide Prevention Resource Center. Learn more about the program here. This 1-hour training raises awareness about how Adverse Childhood Experiences (ACEs) and toxic stress can impact children throughout their lifetimes. When exposed to high amounts of prolonged stress it can affect their developing brains and shape how they see, feel and react to situations for the rest of their lives. Not only that, if left untreated it can lead to self-medicating (drug and alcohol abuse, tobacco use, self-harm, suicide, etc. ), and can affect the health of that child as they get older (high blood pressure, diabetes, obesity, heart disease, etc.). While Adverse Childhood Experiences (ACEs) can impact the life of a child – a loving, caring, healthy relationship can offset the damage caused by ACEs. Resilience is a combination of skills learned through healthy relationships that help us overcome the adversity we have experienced in life. Schools typically receive more in-depth training by a master trainer, who delves into the neuroscience behind ACEs. Those sessions range from 2-8 hours and can provide attendees with OPI/CEU credit hours. Information provided by the Suicide Prevention Resource Center. Learn more here. Institute is a non-profit that provides free education and support for all Americans to engage effectively with the military community and bridge the military-civilian divide. PsychArmor recruits nationally recognized subject matter experts to create and deliver short online courses about issues relevant to the military and Veteran communities. Its self-paced courses are delivered within nine topic areas geared toward military culture, healthcare providers, employers, K-12 educators, higher education, volunteers, caregivers and families, transitioning service members, and communities serving Veterans. The institute provides critical resources to all Americans who work with, live with, and care about Veterans. Mental Health First Aid is an eight-hour course that teaches for anyone 18 years and older how to help an adult who may be experiencing a mental health-related crisis or problem. Topics covered include anxiety, depression, psychosis, and addictions. Specialized courses are also available for public safety officers and military families. Training can be split into smaller sessions over the course of a few days. Information provided by Mental Health First Aid USA. Learn more here. 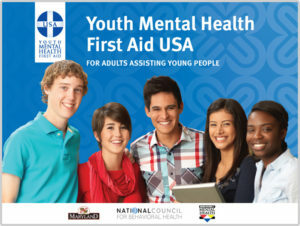 Youth Mental Health First Aid is an eight-hour course designed to teach parents, family members, caregivers, teachers, school staff, peers, neighbors, health and human services workers, and other caring citizens how to help an adolescent (age 12-18) who is experiencing a mental health or addictions challenge or is in crisis. Youth Mental Health First Aid is primarily designed for adults who regularly interact with young people. The course introduces common mental health challenges for youth, reviews typical adolescent development, and teaches a 5-step action plan for how to help young people in both crisis and non-crisis situations. Topics covered include anxiety, depression, substance use, disorders in which psychosis may occur, disruptive behavior disorders (including AD/HD), and eating disorders. Training can be split into smaller sessions over the course of a few days. Applied Suicide Intervention Skills Training (ASIST) is a two-day interactive workshop in suicide first aid. ASIST teaches participants to recognize when someone may have thoughts of suicide and work with them to create a plan that will support their immediate safety. Although ASIST is widely used by healthcare providers, participants don’t need any formal training to attend the workshop — anyone 16 or older can learn and use the ASIST model. Information provided by LivingWorks. Learn more here. CIT is offered once a year per region in various communities around the state. The next Helena training is scheduled for March 2020.